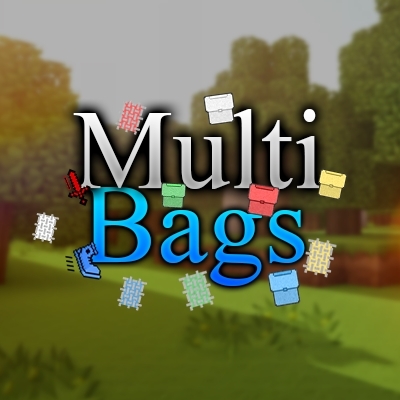 hi nice mod tho it is limited with jei info as it does not give crafting recipies for any of bags or how to upgrade to the next tier of bag. only figured out the 1st bag from your image off this mod images tab. It's just alpha=) I will add JEI support in next update. So, if you want to do in now, you can check it in 1.12.2 version. That could reduce/prevent failed attempts to use your mod. "P.S: This mod request ZarakLIB and Baubles"
It should say "NOTE: This mod requires ZarakLIB and Baubles"
Thank you, rewrite note part. I really want to use this mod, however for some reason it (or zaraklib) prevents me from applying the Monsterley resource pack when combined with another mod. I'm not sure what the other mod is, I'm still working on tracking it down (it's a long process). When I apply it and hit done, it just goes back over to the unapplied resource packs list after it tries to load. Do you have any idea why this would be happening or how I could fix it? PS. Could you please add versions to the .jar file title of your ZarakLIB mod? It's hard to remember if I have the latest version without those. It definitely seems to be the library itself since I still have the issue with only the library and not the multibag mod installed. Okay, so it appears to be an interaction between ZarakLib and Cathedral (https://minecraft.curseforge.com/projects/cathedral) and Monsterley (https://minecraft.curseforge.com/projects/monsterley). With both ZarakLib & Cathedral installed minecraft fails to apply the resource pack. Awesome! That seems to have fixed it. Thanks! Hello, congratulations for such an excellent mod, I have always liked the backpack mod, I hope you understand me since I use a translator, so far the only drawback with the mod is that when the inventory is full it eliminates the loose items, if you can tell me something about it I thank you. Yeah... keep that spanish(?) comment!